John Krasinski is totally down for a revival of The Office, but he doesn't want it to be a full season. 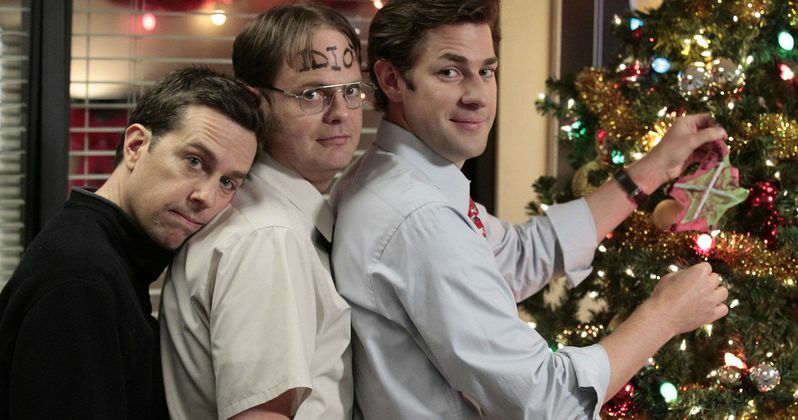 Instead, the man who plays Jim Halpert says he would rather see NBC bring back the cast for a Christmas special. It's not that Krasinski doesn't want to commit to more of the show, but he just doesn't want to tarnish what they accomplished in the finale. The actor and director is currently promoting his new movie A Quiet Place, which recently premiered at SXSW to rave reviews. Speaking about NBC's current plans to bring back The Office and whether or not he's game to return, John Krasinski said in a recent interview, "It's one of those things where I'm sure people don't believe me when I say I would totally do it, because the truth is I would totally do it." Krasinski said as much during a recent appearance on The Ellen DeGeneres Show as well. But this time, he talked a bit more in-depth about it, and explained his idea for doing a Christmas special. Here's what he had to say. "I don't think anybody in our show sees that we didn't end it the way we wanted to end it. We're one of the very lucky shows that got to end when we wanted to, how we wanted to. So I don't know how it exciting it would be to do a run of the show, 'cause you don't want to retread old things and have people not be as excited about it as they are now...I think the UK thing that I always have pitched and wanted to do is that Christmas special thing, where we do a Christmas special this year and then two years from now, or three years from now, we do another one. I love that idea coming back finding out where everybody is. I would totally be down for that." While it sounds like NBC wants a more substantial revival of The Office, which will reportedly feature some of the old Dunder Mifflin crew, alongside some new cast members, what John Krasinski is pitching makes a great deal of sense. The Office had a very satisfying conclusion and that's not a feather all long-running shows get to put in their cap. Plus, as the actor revealed, everyone from the cast still gets along very well, even after nine seasons together. "I remember talking to other people on TV shows and they were like, 'Fifth season, right? That's when you all started hating each other?' and I was like, 'No, was that when you started hating each other?' and they were like, 'Hell yeah, fifth season and I was like nope.' Right until the end, we were a family, we were emotionally connected, we all cried our eyes out on the last day. Yeah, we were all moving on to other things, but not because we wanted to get off the show. It was sort of a magical existence." There's currently no word on when specifically this potential revival of The Office could come together, but it looks like it would likely be for 2019 at this point. But who knows? Maybe NBC could get the old cast back together for a Christmas special this year to test the waters a bit, then move forward with a full revival season if that goes over well. This news comes to us courtesy of IndieWire. The Office Cast Reunite on Instagram, Is the Revival Close to Happening?